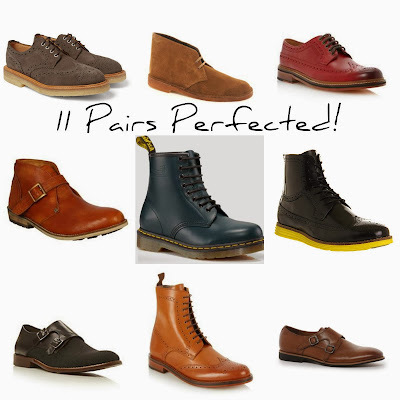 On the eleventh day of Christmas I spotted this for me... 11 pairs perfected! You may not have noticed but I have a thing for shoes. I named my blog after my favourite (worn out and priceless) pair of Berties. Shoes are possibly the best way for a man to inject humour, colour or personality into an outfit without looking too try-hard. So I have compiled a list of my 11 favourite and coveted shoes (this does not include the many pairs I have already featured in my countdown) that would bring a smile to this little rogue's face on Christmas morning. Left to right from the top! Aldo Gell boots £55.99 A combination of suede and leather, rugged yet refined. KG Kurt Geiger Micham boots £65.00 I love the double monk placket face. Mark McNairy suede wingtip brogues £310 Mark McNairy makes me happy. Clarks Originals desert boots £79.00 These will become your go-to casual shoe. Bertie Braxton brogues £83.00 I heart Bertie brogues and this red is a bold choice. Feud Viron boots £84.00 This cross between a biker and logger boot is fun and informal. Dr Martens navy boots £54.00 Channelling my 90's kid, I loved Docs back in the day. Navy makes them a bit less obvious than black or oxblood. Office Ask the Missus black neon boots £45.00. Ok so I have often said I don't like black footwear, but the high shine and neon soul on these are awesome. I can live vicariously through my more daring fashion friends. Dune Bladerunner monk shoes £62.00 The mixed material combination will break up a mundane suit. J by Jasper Conran high top brogues £96.00 These will look great with an ankle-skimming turn-up on your jeans or equally smart with a pair of wool trousers. Antoine + Stanley Knox monk shoes £80.00 The double monk is a fresh update when you want to try something different. My countdown would not have been complete without a footwear feature and I'd love to hear your thoughts on my selection. 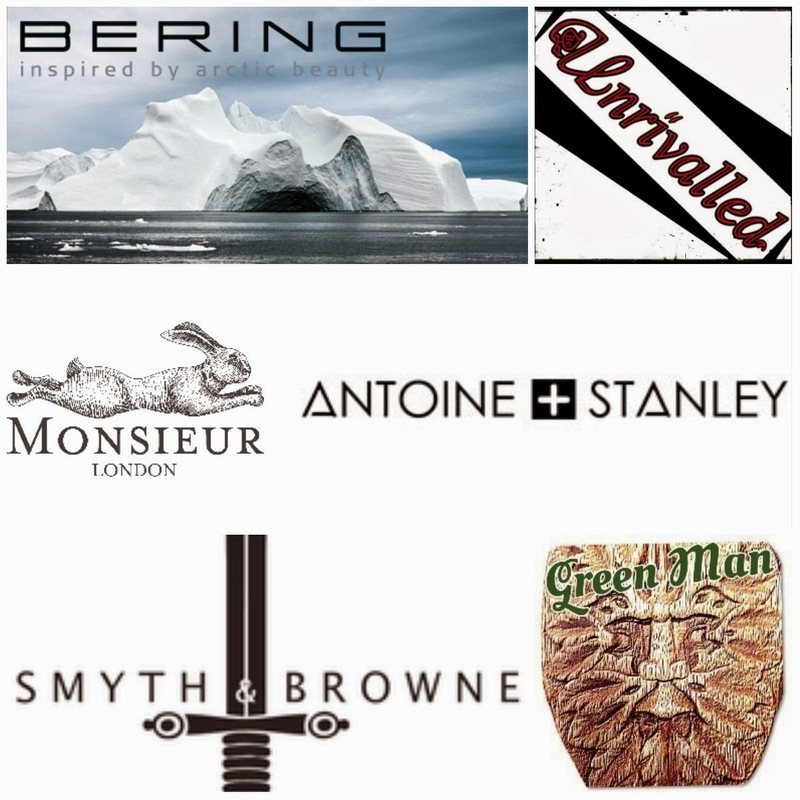 On the tenth day of Christmas I spotted this for me... 10 labels to look for! 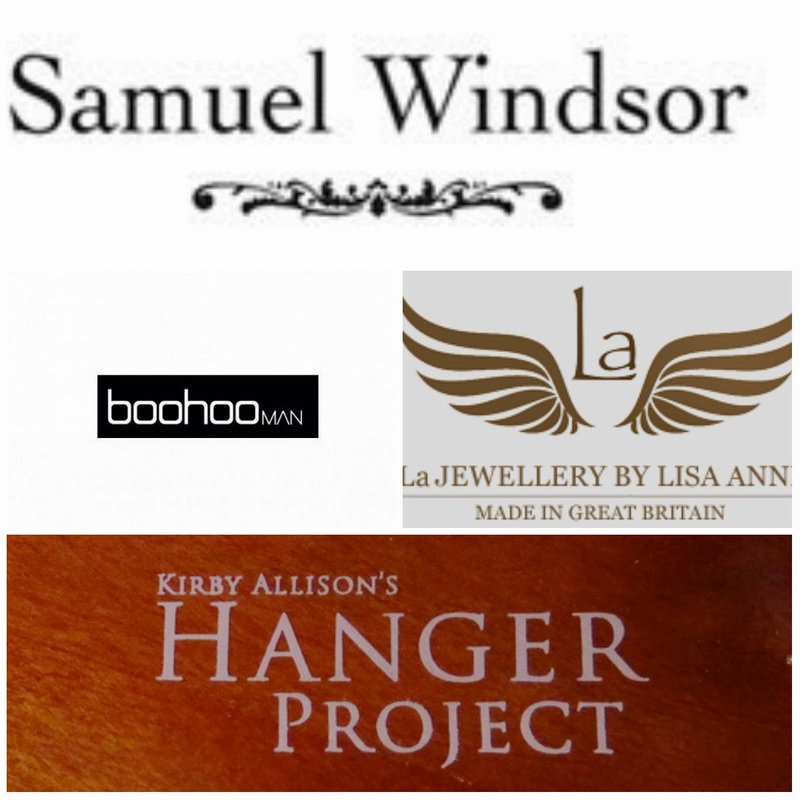 Since I started my blog I have found some great businesses who are supportive of the blogging community and have been kind enough to send me products to review. So I thought I'd give them a shout out and thank you for their help! Smyth & Browne. Understated masculine style, clean lines and simple designs are what Smyth & Browne is all about. They don't go for gimmicks or trends, they just seek to offer modern alternative to menswear classics. Be Unrivalled: Art is not just for walls; Be Unrivalled take graphic design and apply it to fashion. This means bold prints and eye-catching typography. La Jewellery: I was lucky enough to win a pair of cufflinks via Chivalrous blog and I've instantly fallen in love with their hand-crafted accessories. I'll have a full feature on my new cufflinks soon! Samuel Windsor: This one-stop shop is packed full of classic menswear pieces from blazers to brogues. They have continually offered support and I'm proud to be able to thank them here. Monsier London: a capsule collection of ties and accessories, their pop-up boutiques are little havens for those in the know. Boohoo Man: The men's extension of boohoo, this new kid on the block is a contender for the best value in trend-led menswear. They are friendly and supportive of bloggers providing lots of information and retweets. 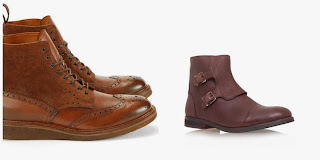 Antoine + Stanley: I won a pair of their shoes through Menswear Style. They take traditional footwear styles and update them with materials and unusual colours; just the thing to refresh a boring work wardrobe. Bering watches: I work with Bering in my day job and was proud to be part of the team to bring it into the brand portfolio. I've bought one for me and one for the BF. I love their understated and minimal designs, a timepiece that is timeless. A big thank you to the folks at these companies for their continued support of bloggers big & small - Merry Christmas to you all! On the ninth day of Christmas I spotted this for me... 9 latest discounts! Due to a scheduling error (also known as an IFU - Ian F**k Up) this post is a day late. Mortified. So today is supposed to be about ladies dancing, but sorry girls, this one is men only. With Christmas almost upon us, many retailers, both online and on the high street have already started their sales. 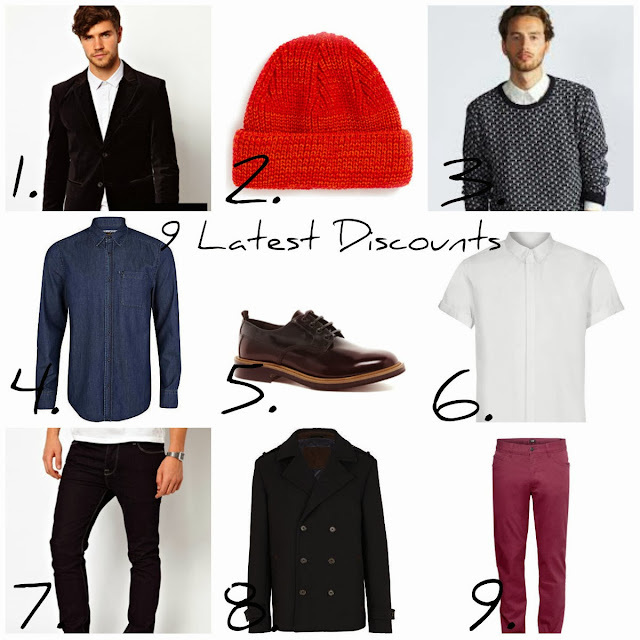 I've rounded up 9 pieces that I think represent value; both in terms of price and the wear you will get from it. Topman orange mini beanie £8.00 £4.00 Orange is the new black. A pop of colour will brighten up a dark winter outfit. Boohoo drop stitch crew neck jumper £12.00 £3.00 For 3 quid, you're a much if you don't buy this. It's a touch of 90's grunge, team with skinnys and you're sorted for the weekend. River Island dark was denim shirt £28.00 £15.00 Everyone needs a denim shirt. Wear it casual with chinos or play with a dress-down Friday and wear with a tie. ASOS burgundy derby shoe £60.00 £42.00 Because your shoes don't always have to be black or brown. Topman short sleeve white shirt £22.00 £10.00 Mix it up a little and go formal with a short sleeve shirt. The hidden placket is just asking for a bow tie. ASOS Premium Slim Jeans £30.00 £24.00 Dark denim - just buy them. River Island navy double breasted pea coat £85.00 £45.00 The pea coat is a men's fashion classic and this will be something to save for next winter (and a few after that). H&M burgundy trousers £14.99 £8.00 I've had these trousers in about 5 colours - I love the slight stretch and slim fit. They work as jeans or trousers so you can wear them pretty much anywhere. The early bird catches the worm and the coat and the shoes and the shirt. Get the bargains before they go! On the eighth day of Christmas I spotted this for me... 8 manly must-haves! Every man needs a basic kit and I've pulled some suitably masculine bits & pieces that will see him through any of life's toughest challenges. Uniqlo black v-neck merino sweater. This is a wardrobe staple that works with trousers & jeans. This & the Converse are my only concession into wearing black! Gap 1969 skinny jeans £29.99. Dark denim always looks smarter and can carry you from day to a night out with a change of your shirt. Avoid gimmicky washes, pockets and finishes. Monsieur London Olderfleet tie £63.00. A simple smart tie is a true investment, This knitted silk tie can be worn to work or a wedding. Converse All Star Hi Tops £47.99: In my opinion, the only casual footwear option. These little beauts are your weekend wardrobe essentials. Calvin Klein boxer trunks £28.80: No y-fronts or baggy boxers. Simple, no silly pattern and for the love of god throw them away after a year. Burton grey 3 piece suit £134.00. I'm going back to the 3 piece. Every man needs a suit in his wardrobe and this affordable suit is a great starting point. Grey is more versatile than black and the 3 pieces can be broken up; wear the waistcoat and jacket with jeans. H&M plain white t-shirt £3.99. It doesn't have to be designer to look great. A fitted, bright white t shirt is a style classic. Just make sure it stays white! Victorinox jelly Swiss card £12.59. 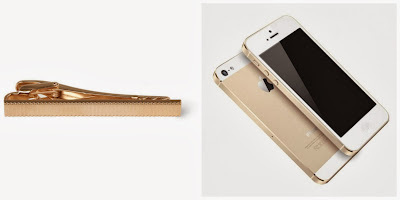 Every guy like a gadget. This little kit fits into your pocket and is packed with essentials like scissors, screw driver & blade! Any of these pieces will form a strong basis for any man's wardrobe. It's once these essentials are in place we can begin to play with pattern and colour. You don't decorate a house before it's built; cliched but true! On the sixth day of Christmas I spotted this for me... 6 geezers gifting! Now as indulgent as my 12 Days of Christmas is, I can't ignore the fact that I need to do some gift shopping myself. Burton have set a challenge called #GiftsForGeezers, choose the perfect present for the men in your life. 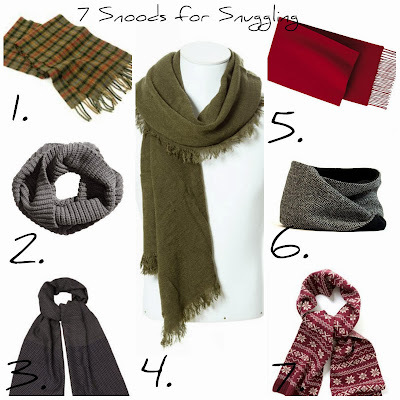 I've adapted it slightly to fall into my little series so here are my 6 Gifts for Geezers! Tan formal brogues £48.00: For Caelan the BF. He constantly needs new shoes for work and as a recent inductee to the world of brogues, these are a great alternative to the usual black. Navy shawl neck jumper £25.00: For my brother in law David. He's a big tall guy and the shawl collar will balance out his shoulders, plus it makes an interesting change to a crew neck or v neck for winter. Montague Burton 3 piece herringbone suit £259.00: For me: I have an enduring love for 3 piece suits and this heritage piece is amazing. I don't often have the occasion to wear a suit, but I could easily break it and wear the waistcoat and jacket with jeans. Fairisle Onesie £25.00: For my nephew Luke. Perpetually locked in his bed room, this onesie will keep him warm during his marathon Medal of Honour campaigns. Men are perhaps the simplest yet most complex of creatures. Fussier than they may seem, buying gifts for them is a bit of a nightmare. I hope my posts so far have provided a little bit of inspiration! 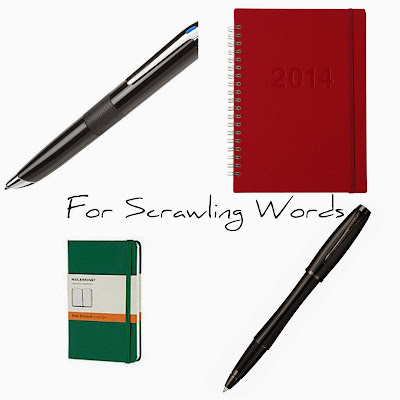 On the fourth day of Christmas I spotted this for me... For scrawling words! 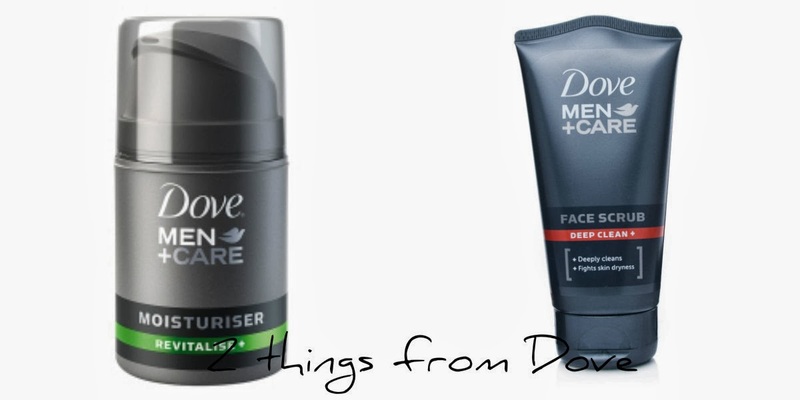 Day four of my 12 Days of Christmas bring yet another tenuous pun and a selection of gift ideas if you are stumped for what to buy the man/men in your life. I am an avid stationery collector and can kill an hour in Paperchase or Muji marvelling at pens and notepads. I constantly have a notepad and diary on the go in my day job. A journal, even a blog, is a great way of decanting all your cluttering thoughts, either for yourself or for sharing. So inspired by that (and my perpetual New Year's resolution to write more) I've made a little selection of stationery and ephemera. While we all rely on our phones and computers to keep us organised, there is really nothing as satisfying as ticking off a task completed in your diary! Livescribe 3 Smartpen. This handy piece of tech records and converts your scribbles into text when you use it with the app or even jotting on a pad. If you're like me and forget what half your notes are referring to, being able to sort and search them afterwards makes a lot of sense. Muji a5 monthly/weekly diary. I love Muji, I have even travelled to Dublin just to visit the store in the past. This neat little diary is a great size and the red cover is bold without being garish and it also makes it easier to find in the bottom of your bag. Parker urban matte black rollerball. What is cooler than black? Matte black so this sleek little pen is a sophisticated addition to your pocket. Just don't lend it to anyone. Moleskine oxide green notebook. Moleskine are the notebooks every other note book wants to be. The BF bought me an a5 book and I've yet to start it (I think I'm too afraid of ruining it with my messy handwriting). Available in a variety of sizes, they make a perfect travel journal with their little pocket in the back cover. On the third day of Christmas I spotted this for me... 3 French scents! Continuing my Christmas countdown and in keeping (well, trying to) with the 12 Days of Christmas rhyme, I move on to day 3. I couldn't find anything hen related so it's on to the French scents instead! Us menfolk are apparently quite difficult to buy for but a new scent is always a good idea. I wrote about my favourite go-to scents in a post a while back but thought I would update it for the festive season. Chanel Pour Monsieur. Why should women get all the luxury with No.5? Chanel Pour Monsieur is a spicy yet fresh combination which should get him through the rest of winter. Jean Paul Gautier Le Male. The iconic bottle aside, this light scent is a great all-rounder; wear it to work and leave the heavier scents for the nights out. 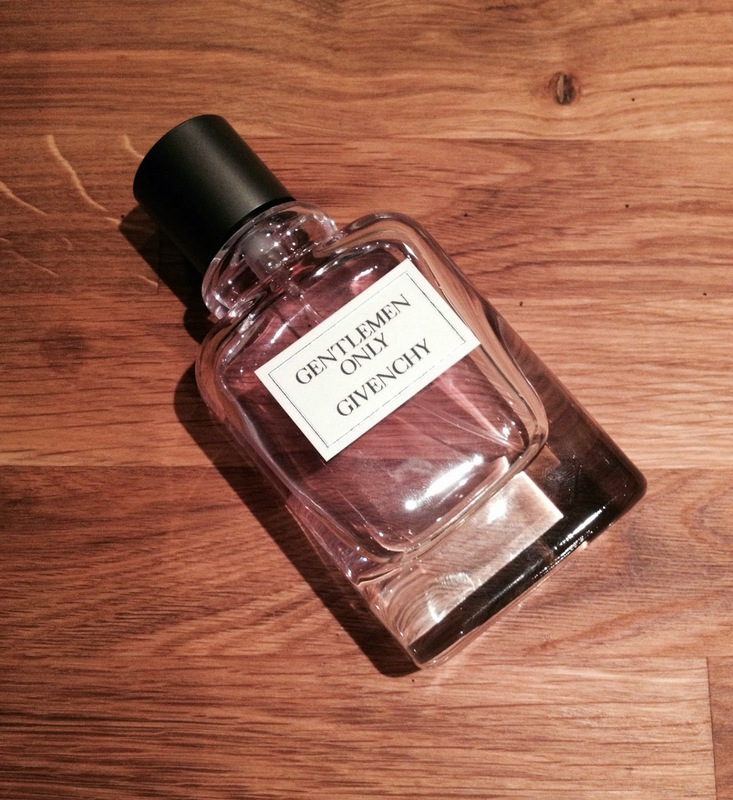 Givenchy Gentlemen Only. Since I got this in the summer it is slowly edging my previous scent of choice Marc Jacobs Bang further and further to the back of the cabinet. It's woody and warm and lingers without being over powering. Finding a scent that suits you is an ongoing experiment as your taste changes over time. Keep trying and drop plenty of hints any chance you get for something new. The 12 days of Christmas traditionally runs from Christmas Day until the 5th of January but it seems now people take it as the first 12 days of December. As nobody else seems to be following the rules, I thought I'd put my own twist on it and my 12 days will run from today until Christmas Eve! 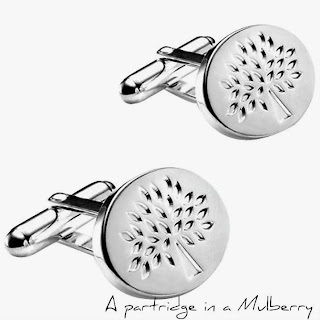 This simple steel pair from Mulberry are a classic addition to any wardrobe and will go with everything. Think of them as an investment and a future heirloom. Remember though, a double cuff shirt is not for casual wear. If I catch you wearing one with jeans, you'll go on the naughty list! Stags and antlers have gone from natural history and men's club to fashion staple in the last few years. Interiors, apparel, tattoos; you name it, it's probably had a stag printed on it. 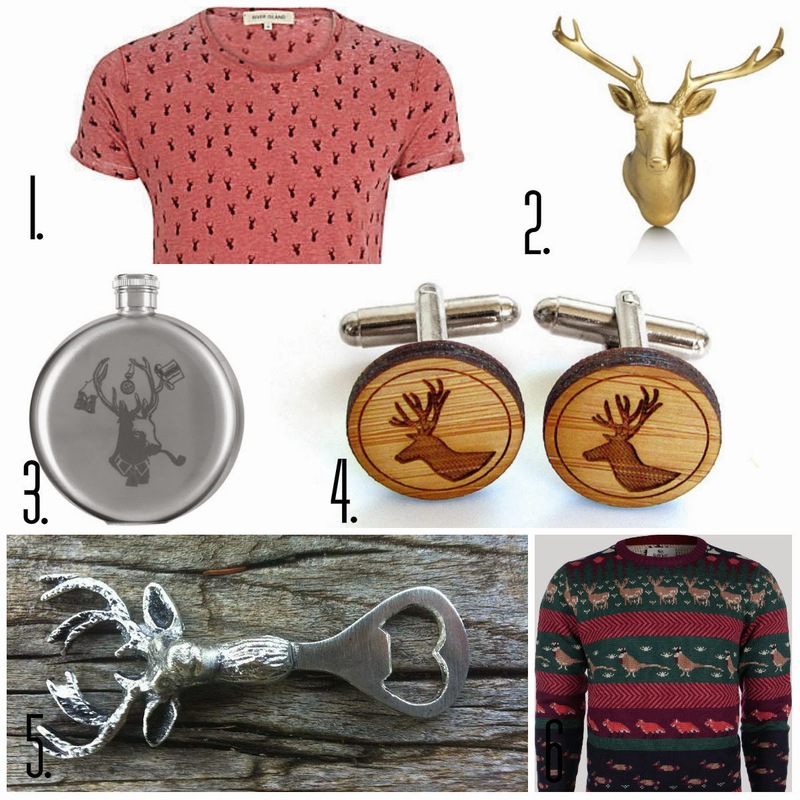 Owls and foxes seem to be the choice for womenswear and accessories whereas stags (being male) are much more suited to menswear. The stag is a strong masculine icon and the associated energy makes it one of the few times it's acceptable to have an animal on your clothing. There is a line though, while the season of novelty knitwear is upon us, reindeer (red nosed or otherwise) should be kept to a minimum! 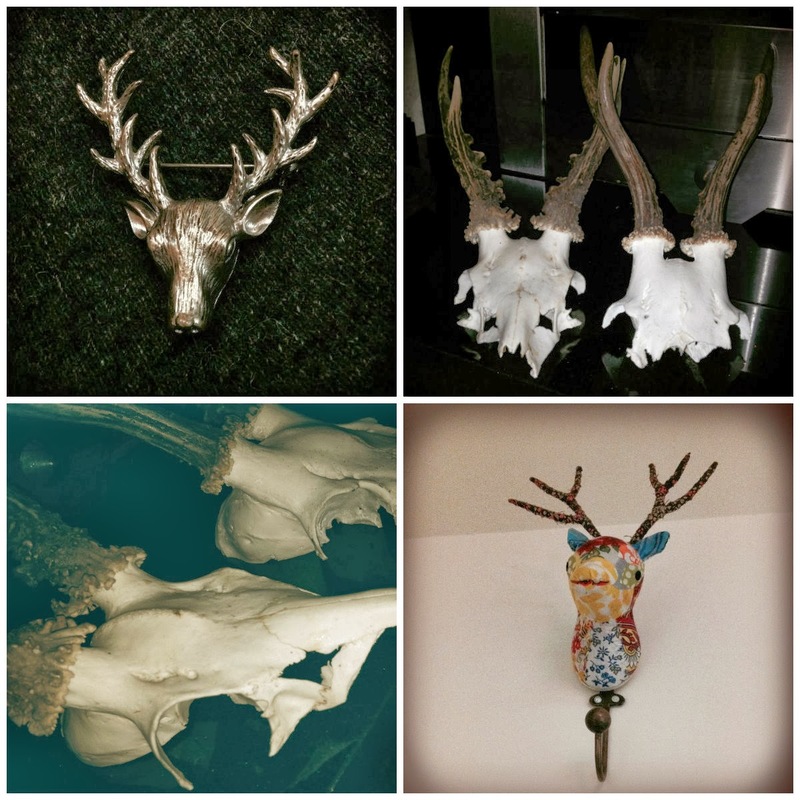 I have a thing for stags, with a selection of skulls, heads and accessories I've collected over the year. As the season of wishing draws closer, I've complied a little list of the bits I'm coveting and that I think would make great gifts for the fellows in your life. River Island red stag tee £18.00. A great casual bit of kit. Paperchase engraved stag hip flask £15.00. To keep the cold out. Bellfield Surnia jumper £40.00. Christmas appropriate without being too cheesy. Sorry to any reader expecting a post about actual stag nights - I have no experience of this social phenomenon but hope this stylish alternative has been just as informative. What animal motifs have caught your eye/imagination this season?